The ON/OFF/BRAKE lever on the lathe is not working. The way I understand it should work, is that in the rightmost (clockwise) position it should act as a brake, and if lifted up and turned counterclockwise, it should turn the lathe on. 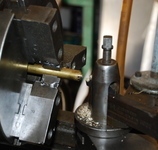 However, it does not do a good job and the lathe is always on regardless of the position of this lever. I can still turn the lathe off by manipulating the little lever in front of it (REV2/REV1/OFF/FWD1/FWD2) and switching from forward to neutral, but I feel that it is wrong and is a safety issue as the lathe sometimes needs to be turned off and braked instantly with one handf. On the back of the lathe, the big lever is connected to a steel bar. (the top one) This steel bar has a oblong hole for the brake engagement. However, the screw for the brake falls out of this oblong hole. 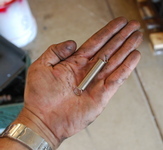 The bar still engages the brake by acting on the side of the nut, however it does not feel right. 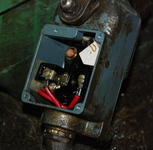 The switch that should turn the lathe on and off, seems to be operated by the lower bar. 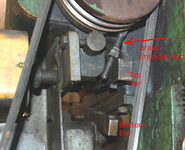 The last photo shows that this bar should be permanently pulled up by a spring (see spring mounting pins) but the spring is missing. I believe that with the spring, the feel of the ON/OFF/BRAKE lever would be different and it would "click" as the dimples on these two bars engage and disengage. 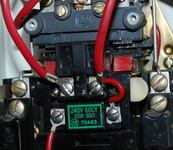 HOWEVER, and this is the crux of the problem, the limit switch that should be operated by the lower bar, does NOT open or close any contacts on the lines that lead into it from the main motor starter. I have a feeling that someone messed with this and bungled this issue. Has anyone seen anything similar? I finally understood what was wrong. My own reconstruction of what happened at some point prior to my lathe purchase, is as follows: the missing spring broke or was lost. Because of this, the lathe would not turn on. Then the dumbass who was fixing the lathe tried to rewire the starter. To no avail. 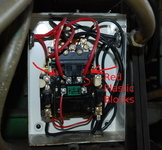 Then he or she inserted red plastic blocks into the size 0 starter, therefore fixing it mechanically to be always on. When I realized the nature of these red plastic blocks, the fix was obvious: remove then, rewire the starter for a single non-momentary switch, and use a spring to fix the original mechanical problem. I was very lucky, because I had a nice coil spring assortment (pictured). So, as of now, the problem is fully resolved and the ON/OFF/BRAKE switch works great!